In 1941, the Republic P-47 Thunderbolt had just entered production, and hundreds of the aircraft had been ordered. However, led by Alexander Kartveli, the design team at Republic stayed at the forefront of fighter development by incorporating new engines into new airframe designs. In July 1941, Republic submitted two new designs to the United States Army Air Force (AAF), the AP-18 and the AP-19. The AP-18 was a unique interceptor fighter powered by the Wright R-2160 Tornado engine. The AP-19 design was more conventional and was powered by the Pratt & Whitney (P&W) Wasp X (R-4360). Both engines were under development, but the R-2160 was anticipated first and received much interest from the AAF. As a result, the AP-18 design was ordered on December 1941 as the Republic XP-69. The first Republic XP-72 prototype soon after being completed. The 14 ft 2 in (4.23 m) diameter Curtiss propeller was one of the largest used during World War II. By 1943, the R-2160 engine had encountered major issues, but development of the R-4360 engine was steadily progressing. Republic felt the AP-19 design held more potential and wanted to end work on the XP-69. The AAF agreed, and the XP-69 project was cancelled on 11 May 1943. Two prototypes of the AP-19 design were ordered on 18 June 1943, and the aircraft was designated XP-72 (it also carried the “Materiel, Experimental” project designation MX-189). 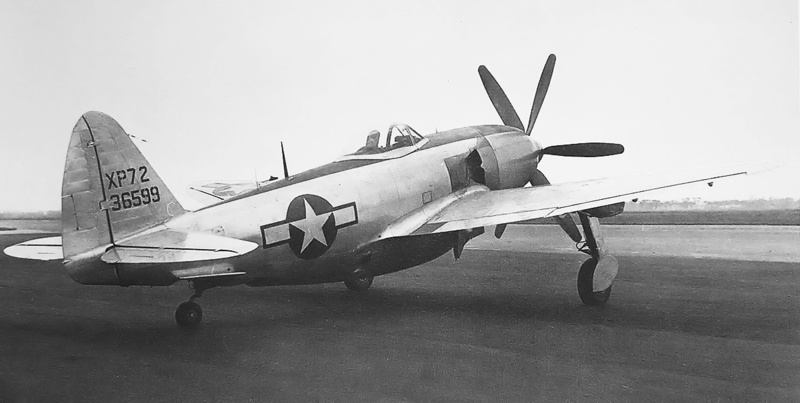 In addition, Republic felt the XP-72 was superior to the XP-47J, an interceptor derivative of the P-47, and asked that the second XP-47J prototype be cancelled. The AAF approved this request, and Republic focused on the XP-72. 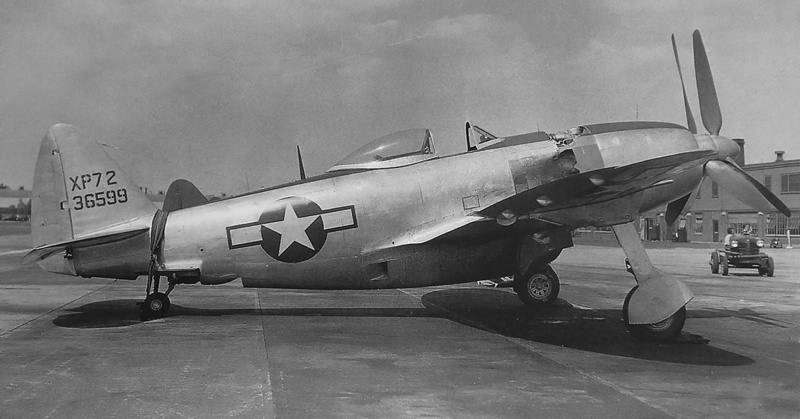 The XP-72 was often called the Super Thunderbolt, or Superbolt, or Ultrabolt, and it benefitted from everything Republic had learned with the P-47 series, including the XP-47J. The XP-72 was essentially the wings, fuselage, and tail of a bubble-canopied P-47D combined with the close-fitting cowling used on the XP-47J. Of course, numerous internal changes made the XP-72’s resemblance to the P-47 a superficial oversimplification of the new aircraft’s design. Under the close-fitting cowling was a 28-cylinder P&W R-4360 engine. The engine drove a fan at the front of the cowling to assist cooling. A small cowl flap was positioned on each side of the cowling. The cowl flaps were automatic but could be manually controlled. At the cowl flaps, air exiting the cowling was combined with exhaust gases being expelled through ejector stacks and provided a small amount of thrust. The Pratt & Whitney R-4360-13 and -19 engines had a remote, variable-speed, first-stage supercharger. This large supercharger was installed behind the XP-72’s cockpit and was connected to the engine via a fluid coupling. The XP-72’s R-4360 engine used two-stage supercharging. The first stage was a mechanically-driven, variable-speed, remote supercharger positioned behind the cockpit, where the turbosupercharger was located on the P-47. To power the remote supercharger, a covered shaft extended from the unit, through the lower cockpit, and connected to the engine via a fluid coupling. The remote supercharger’s impeller was around 3 ft (.9 m) in diameter. The second stage was the standard supercharger that was integral with the engine. A scoop positioned under the fuselage and in line with the wings leading edge split air into three ducts. The left and right ducts delivered air to oil coolers positioned on the bottom sides of the scoop. The outlet for each oil cooler was on the lower side of the scoop and about at the midpoint of its length. The larger, center duct fed air to the intake on the back of the remote supercharger and to the intercooler. The intercooler was positioned behind the remote supercharger. After being compressed in the supercharger, the air exited via two outlets and passed through the intercooler. After leaving the intercooler, the cooled induction air was split into two ducts and delivered to the R-4360’s downdraft intake, which is where the two ducts merged. The air then passed through the engine’s integral supercharger and into the engine’s cylinders. Cooling air that passed through the intercooler was discharged via an outlet in front of the tailwheel. No exhaust-driven turbosupercharger was installed on or planned for the XP-72 prototypes or the P-72 production aircraft. This side view of the first XP-72 illustrates the aircraft’s resemblance to the P-47 Thunderbolt. The notch just before the tailwheel is the air outlet from the intercooler. The serial number painted on the tail should actually be “336598” to conform to AAF guidelines. Neither XP-72 had the “correct” serial number painted on their tails. 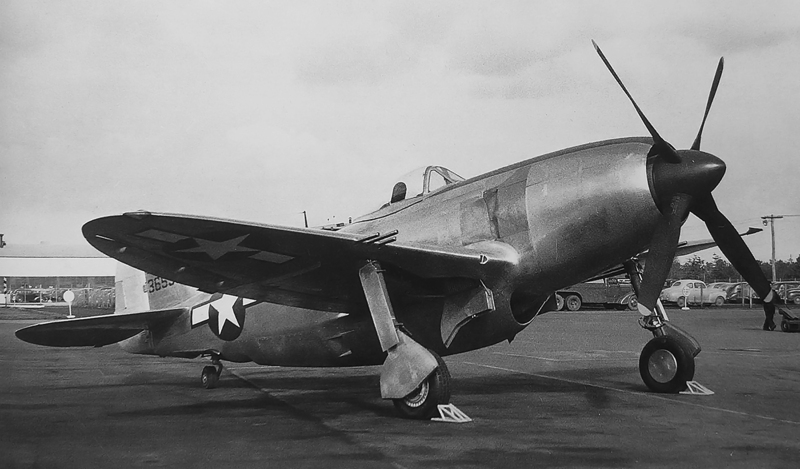 Some sources state the XP-72 had strengthened landing gear compared to the P-47, while other sources say it was the same landing gear used on the P-47. The wings incorporated six .50-cal machine guns (three in each wing) with 267 rpg. However, the gun package could be changed to four 37-mm cannons (two in each wing). A hardpoint under each wing could carry a 150-gallon (568 L) drop tank or up to a 1,000 lb (454 kg) bomb. Just like on the P-47, an inlet for cabin air was located on the leading edge of the right wing. Dive recovery flaps were fitted under the wings, just behind the main gear wells. The XP-72 was roughly the same size and weight as the P-47D but was more aerodynamic and possessed about 50% more power. The XP-72 aircraft had a 40 ft 11 in (12.47 m) wingspan, was 36 ft 8 in (11.18 m) long, and was 16 ft (4.88 m) tall. The aircraft had an empty weight of 11,375 lb (5,160 kg), a normal weight of 14,760 lb (6,695 kg), and a maximum takeoff weight of 17,492 lb (7,934 kg). The XP-72 had a top speed of 490 mph (789 km/h) at 25,000 ft (7,620 m) and an initial rate of climb of 5,280 fpm (26.8 m/s), decreasing to 3,550 fpm (18.0 m/s) at 25,000 ft (7,620 m). The aircraft could reach 20,000 ft (6,096 m) in under five minutes. The XP-72’s service ceiling was 42,000 ft (12,802 m). With 370 gallons (1,401 L) of internal fuel and two 150-gallon (568 L) drop tanks, the aircraft had a range of 1,200 miles (1,931 km) at a 300 mph (483 km/h) cruise speed. The XP-72 was a formidable aircraft with amazing performance. The scoop under the fuselage brought air to the oil coolers, intercooler, and supercharger. The duct in the wing was for cabin air. The close-fitting engine cowling was one of the best installations of an R-4360 and used an engine-driven fan to assist cooling. The first XP-72 prototype (serial number 43-36598) was completed with a single-rotation propeller and a P&W R-4360-13 engine. The Curtiss Electric four-blade propeller was 14 ft 2 in (4.23 m) in diameter, which was one of the largest propellers used during World War II and was probably the largest propeller fitted to a fighter. The propeller left only 5 in (127 mm) of ground clearance, and the pilots employed three-point takeoffs and landings to make sure there were no propeller ground strikes. The R-4360-13 engine could accommodate the remote, variable-speed supercharger, but sources disagree regarding whether or not the remote supercharger was installed in the XP-72. The -13 engine produced 3,450 hp (2,573 kW) with the remote supercharger and 3,000 hp (2,237 kW) without it. The first XP-72 was finished on 29 January 1944. The aircraft’s first flight was made from Republic Field in Farmingdale, New York on 2 February 1944. 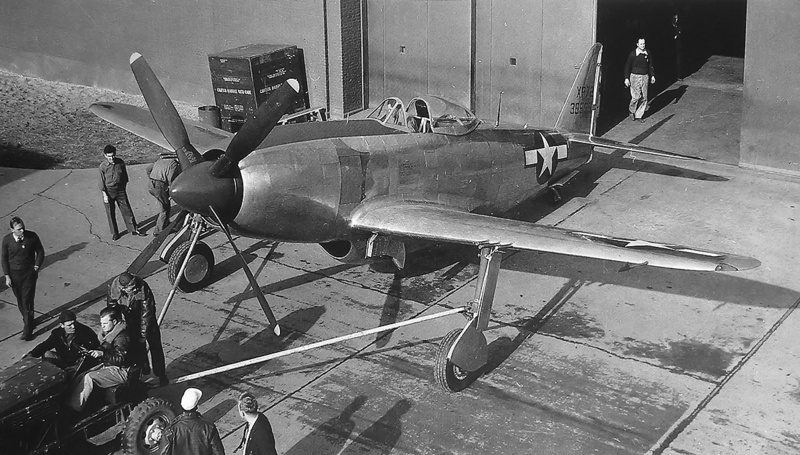 The second XP-72 prototype (serial number 43-36599) used a 13 ft 6 in (4.11 m) diameter, six-blade, contra-rotating Aeroproducts propeller. This propeller gave 9 in (229 mm) of ground clearance, and three-point takeoffs and landings were still the standard practice. Sources disagree on which dash number engine was used in the second prototype. Some sources claim a 3,000 hp (2,237 kW) R-4360-3 engine was used on the second XP-72. The -3 had a single-speed, single-stage (non-remote) supercharger and accommodated contra-rotating propellers, but the -3 engine used SAE #60-80 spline shafts. The Aeroproducts propeller used SAE #50-70 spline shafts, so it seems unlikely that the -3 engine was used. Many sources state the second XP-72 used a R-4360-13 engine, the same type fitted to the first prototype. The -13 engine was single-rotation with a SAE #60 spline shaft and could not accommodate contra-rotating propellers. However, it is possible that a contra-rotating gear case from another engine could have been fitted to the -13. The -8 (Douglas XTB2D) and -10 (Boeing XF8B) engines built for the Navy both used SAE #50-70 spline shafts. It is odd that another dash number was not assigned for such a change, but the -13 engine seems like the most likely candidate to have powered the second XP-72. Other sources propose that the engine was a R-4360-19 (see below), but there is no indication that any -19 engines were built. 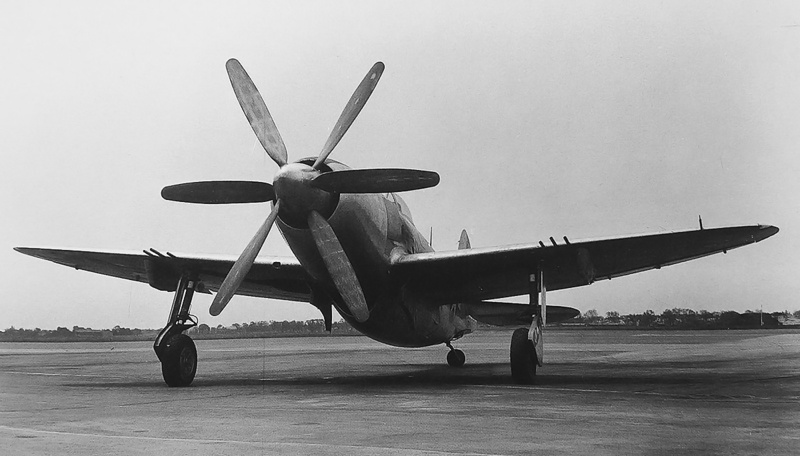 With its six-blade, contra-rotating propellers, the second XP-72 is an impressive sight. Even with its hollow blades, the propeller still weighed around 765 lb (347 kg). Note the installed underwing pylons. Regardless of the exact dash number, the second XP-72 was first flown on 26 June 1944. The contra-rotating propellers had a slight destabilizing effect on the aircraft, but the effect was manageable, and the aircraft still exhibited excellent flight characteristics. It is often reported that the second XP-72 was damaged beyond repair because of an emergency landing following an inflight fire. However, Ken Jernstedt, the pilot on that flight, has stated the incident never happened. In Jernstedt’s account, he was making a high-performance takeoff from Caldwell, New Jersey when an oil seal on the supercharger failed and caused a massive oil leak. Hot oil sprayed into the cockpit, on Jernstedt’s legs, and on the outside of the canopy. When Jernstedt brought the aircraft around for a quick landing, a Vought F4U Corsair suffering from an inflight fire crossed his path. Jernstedt had to veer around the Corsair to land the XP-72, which was damaged in the incident. While the aircraft could have been repaired, the XP-72 program ended soon after. The Republic XP-72 was noted as exceptionally fast with amazing performance and for being a beautifully flying airplane. It is often reported that test pilot Carl Bellinger attained a speed of 480 mph (772 km/h) at sea level, but this speed was most likely recorded at altitude. Almost all sources indicate that both XP-72 prototypes achieved 490 mph (789 km/h) at 25,000 ft (7,620 m). The second XP-72 shortly after an engine run. Note that the tail of the aircraft is tied down. The air outlet from the oil cooler is visible on the lower fuselage, just under the wing’s trailing edge. Another outlet was positioned in the same spot on the opposite side of the aircraft. An order for 100 P-72 aircraft was placed in late 1944. Production P-72s were to be powered by the P&W R-4360-19 engine, which used the Aeroproducts contra-rotating propeller and had an engine-driven, variable-speed, remote supercharger similar to the one used on the -13. The -19 engine was planned to provide 3,650 hp (2,722 kW) at sea level and 3,000 hp (2,237 kW) at 25,000 ft (7,620 m), allowing the P-72 to attain an estimated speed of 504 mph (811 km/h) at 25,000 ft (7,620 m). Further engine development resulting in 4,000 hp (2,983 kW) would reportedly enable the P-72 to reach a speed of 540 mph (869 km/h) at 25,000 ft (7,620 m). The 540 mph (869 km/h) speed seems a little optimistic. An upgraded wing, similar to that used on the P-47N, was to be applied to production P-72s. The P-47N wing held more fuel and increased the aircraft’s span by about 2 ft (.61 m). The speeds mentioned above were most likely estimated with the original, smaller wing. As excellent as the P-72 may have been, the war situation indicated the aircraft was not needed, and the emergence of jet aircraft indicated that the P-72’s speed would soon be outclassed. The order for 100 P-72 aircraft was cancelled on 4 January 1945 so that Republic could focus on the P-84 Thunderjet fighter. On the day the P-72 was cancelled, the AAF ordered 100 P-84 jet aircraft (25 pre-production YP-84As and 75 production P-84Bs). The two XP-72 aircraft survived the war but did not last much longer. One airframe, without its engine, was given to a local (on Long Island, NY) chapter of the Air Scouts in August 1946. The other airframe was eventually scrapped. With the war winding down and jet aircraft on the horizon, the XP-72 never entered production, despite the aircraft’s impressive performance. Production P-72 aircraft could have been the ultimate piston-engine fighter. This entry was posted in Aircraft, World War II on 5 March 2018 by William Pearce. An XP-72 was given to Baldwin Air Scout Squadron #3 at Roosevelt Field Mineola on August 3rd 1946.It was accepted by Legion Post 246. I don’t know what became of the aircraft. Thank you for the additional information on the XP-72 and Ken Jernstedt. Ken Jernstedt was a former AVG/Flying Tiger and one of four from the group who worked for Republic Aviation Corp., .Farmingdale,NY.during WWII. A pleaseure to behold, the XP-72 and the XF-12 were probably the cleanest round-engine installations ever. Nice work, Bill. Thanks for the great article, Bill! Republic is one of the few airframers who really took advantage of the compact packaging that P&W delivered on the R-4360. Too bad that no pictures have surfaced of the XP-72 without the cowling in place. I’m curious about the exhaust routing, but suspect that the installation looks a lot like the home built systems on Dreadnought and Furias. Thank you Robert, I’m glad you liked the article. The XP-72 and XF-12 have always been two of my favorites. I’m sure there are more photos out there somewhere.